Admittedly, this is a departure from what I usually cover here, but since this is a big gift-giving season, I thought some of you might want to put this little gem on your gimme list. Both contain a certificate of reservation with a unique I.D. number registered in the Book of Light™ as well as a first class ticket to heaven, the Official Heaven Identification Card (so you won’t be hassled as you check out your eternal reward), and the Heaven 101 mini informational guide. 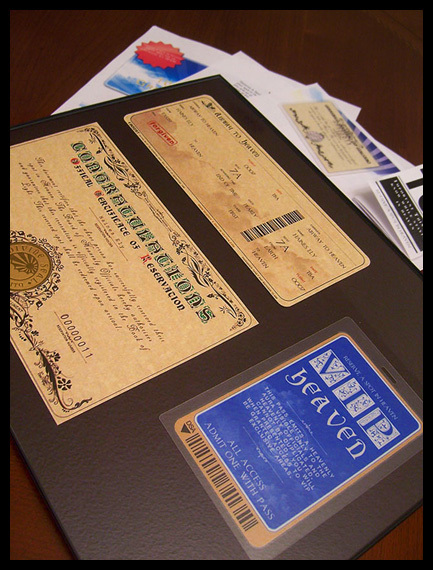 The “all access” kit also contains a VIP pass to the special-access areas of heaven, and includes framing for your ticket and certificate. But here’s the best news — both kits come with a money-back guarantee! The Reserve A Spot in Heaven people are the ONLY official distributors of reservations into heaven. They are directly affiliated with The Board of Heavenly Officials, the only governing body in Heaven. So there! Ye of little faith! There is a better one;www.becomeasaint.comVery offensive!!! !